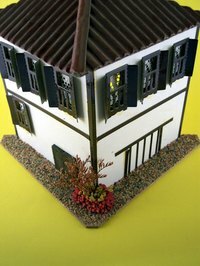 Model building is a fun and exciting hobby that can demonstrate how things work together. To visualize home improvements, your dream home or just for fun, you can create a replica of a house to scale. The materials that you can use to build this house are endless; however, some work better than others. Before building your model home, you need to know what you want to do with it when finished. If it is a toy, you would need stronger building materials and adhesives. If you are going to show it off, you can make the model from cardboard or foam core. Make copies of the drawings in the scale that you have chosen for your model. Paint or decorate the drawings as you want, to match an existing building or to make your dream home. Set these aside to dry. Once dry, attach them to the foam core with glue. Let the glue dry thoroughly. Cut around the edges of the drawings with a hobby knive. Cut out the windows also, leaving the crossbars uncut if you desire. Color or paint the roof and paste it to the foam core. Glue the roof pieces together. Cut the floor plan out and mount with adhesive to a piece of foam core that will serve as the base. While waiting for the glue to dry, take the other pieces that you cut and use the pins temporally, to keep them in position. Check the fit of each wall to the next, and that each wall matches the floor plan. Check that the roof is level and the correct size. Remove the pins and trim the walls, if necessary. Lay the walls with windows so the back side of the foam core is facing up, (the decorated side is down) and measure the windows. You can even lay the clear plastic over the windows and draw the lines needed to cut them out. Make sure they are slightly bigger than the window frame. This will give you somewhere to secure the glue. Cut the windows and then paste them one at a time, allowing the glue to dry. Lay a narrow strip of glue along the floor plan, then set up the first wall. Use the pins again to keep the panel in position while the glue dries. Continue adding walls and securing them with pins until you have made it all the way around the house. Set the model aside and allow to dry completely. Decorate the inside walls also, and paint or make small pictures to look like a real house. You can also make model appliances to go in your model house. Always supervise little children when using a hobby knife.